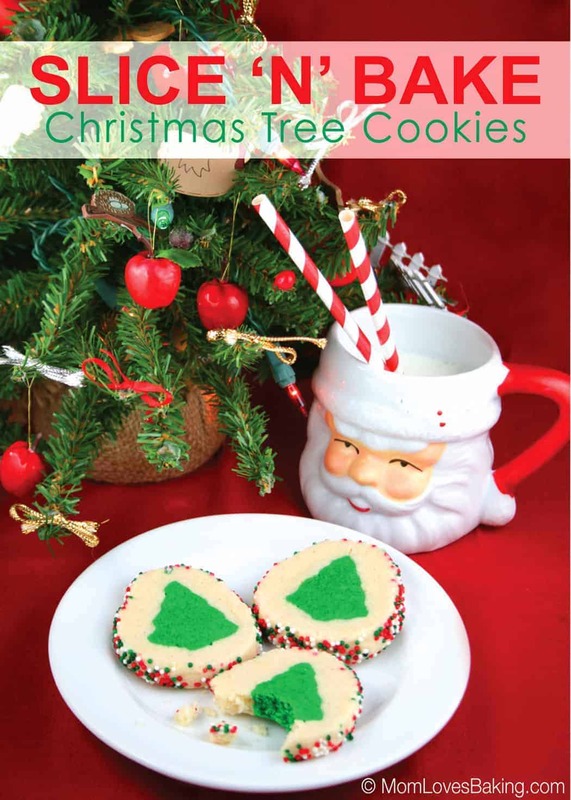 Soft, sweet and buttery sugar cookies with a bright green Christmas tree in the middle. 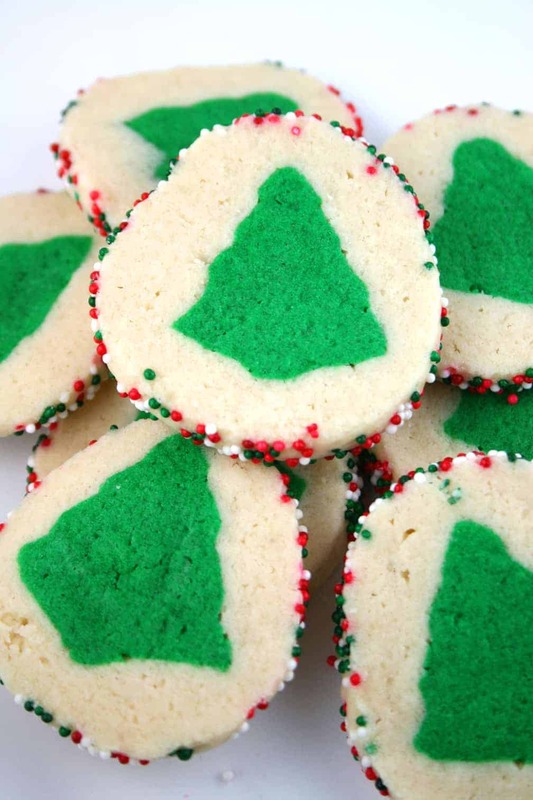 Slice ‘n’ Bake Christmas Tree Cookies. Aren’t they cute! And they’re fairly simple to make. I got to use my new mixer for the first time with this recipe. My husband gave it to me for my birthday last week. My birthday this year was not one I’d like to remember. I slipped and fell on our icy driveway, had to go to urgent care and ended up with a contusion on my elbow. But I did get this awesome mixer, so that was a good thing. Beat the butter and sugar on medium for 3 minutes and you get this beautiful fluffy consistency. Then you add the egg, flavorings and your flour, baking powder mixture. 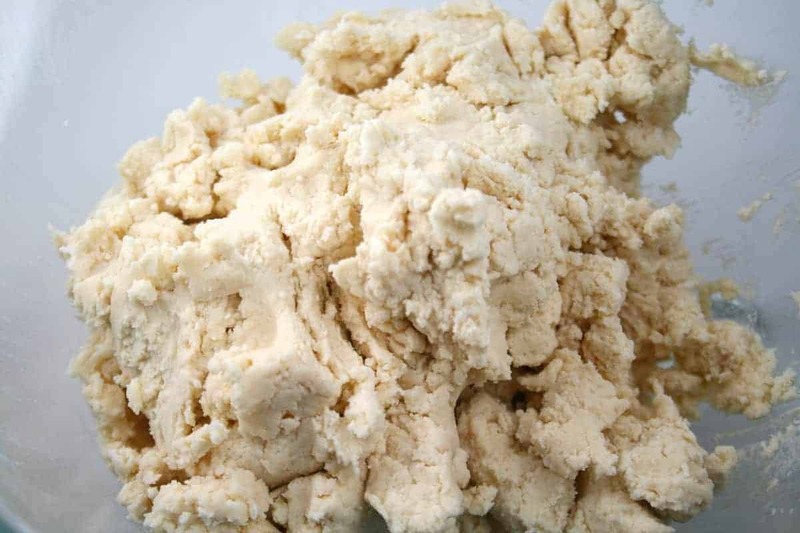 Mix until a dough forms like this. Divide the dough in thirds. Keep two thirds plain and color the other third green. I like Wilton brand food coloring because it’s very concentrated. 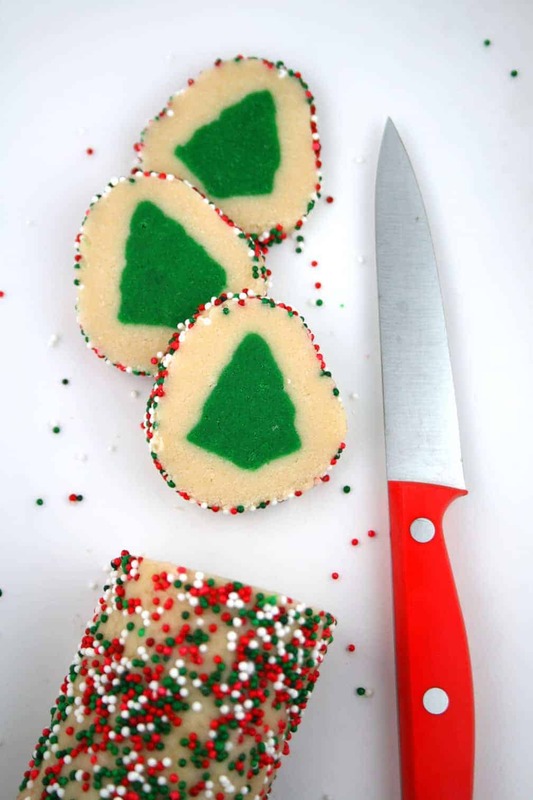 Use a 1-inch Christmas tree cookie cutter. Mine was also Wilton brand. I rolled the dough out to be about 1/2-inch thick. Line up your trees in 3 rows. Divide the non-colored dough into thirds. Place it around the stacks of trees. I found it worked best to roll long, narrow ropes of dough and place around trees that way. Roll the logs of dough in sprinkles. It’s sort of messy but I think it looks so cute. Then wrap in plastic wrap and refrigerate for a few hours. Now the easy part. Slice and bake. 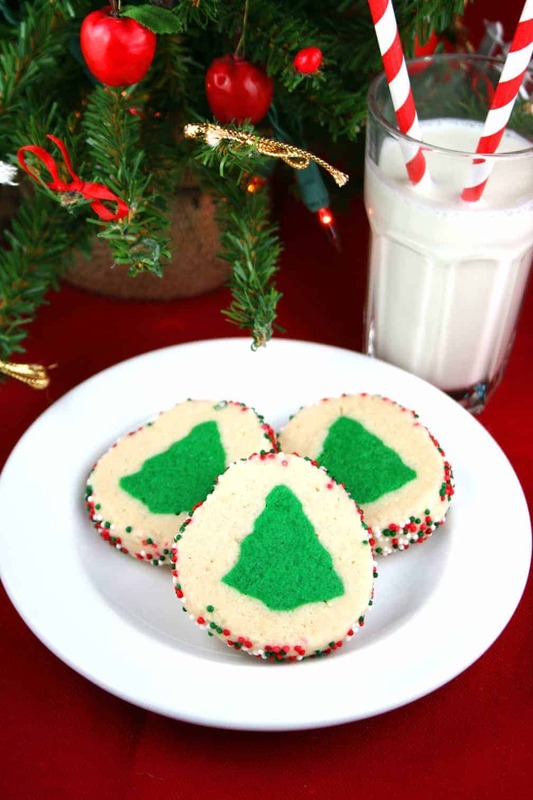 They’re so good and I’ll bet Santa would love them. 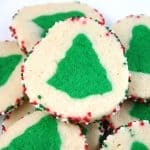 My son is definitely a fan of these adorable Christmas cookies. In a large bowl, stir together the flour and baking powder. Set aside. 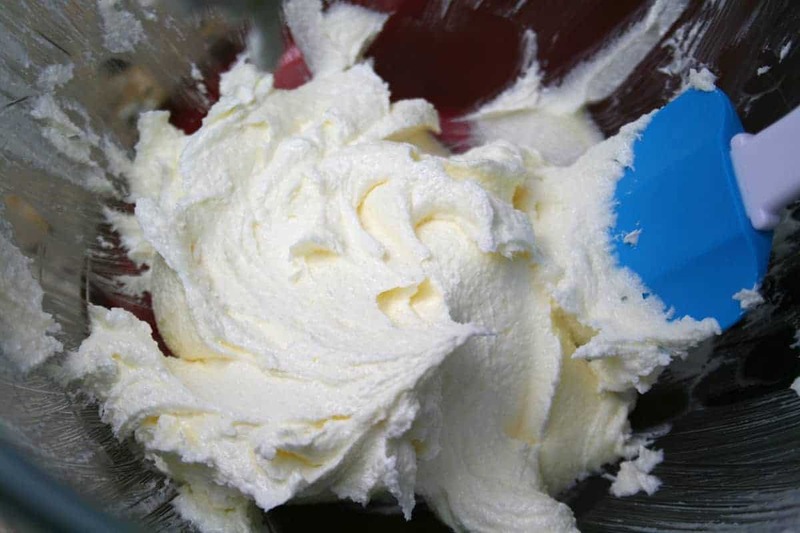 Place the butter and sugar in a large bowl. With an electric mixer, beat on medium for 3 minutes. Add egg, vanilla and almond. Mix until combined. 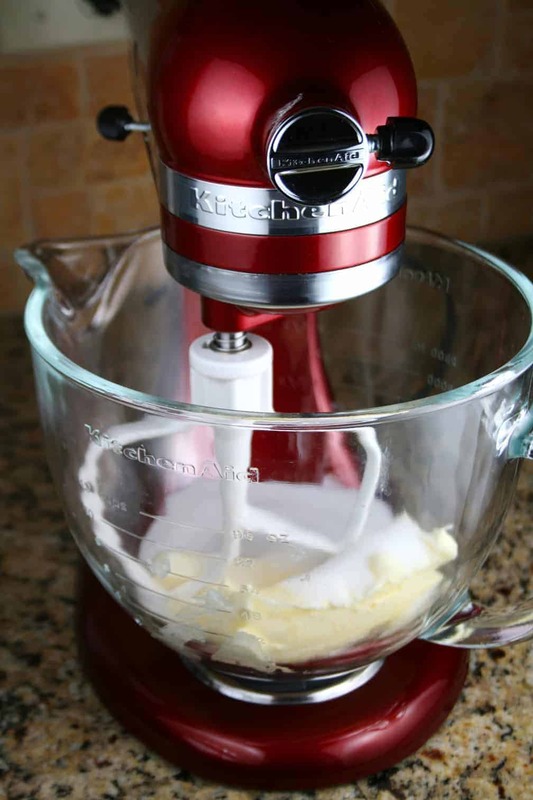 With the mixer on low, gradually add the dry ingredients. Mix on medium until a dough forms. Divide dough into thirds. Keep two thirds plain and color the other third green. I found it easiest to incorporate the color by kneading the dough with my hands. 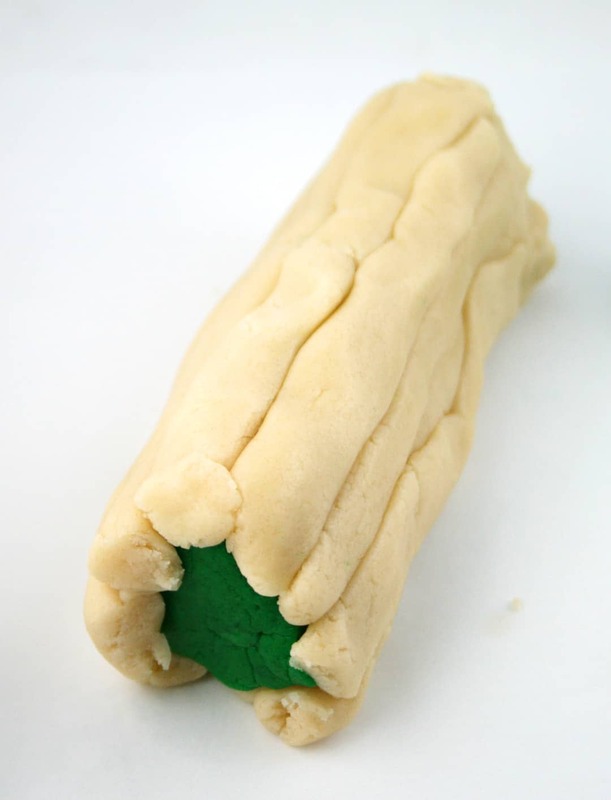 Roll the green dough to about 1/2-inch thick. 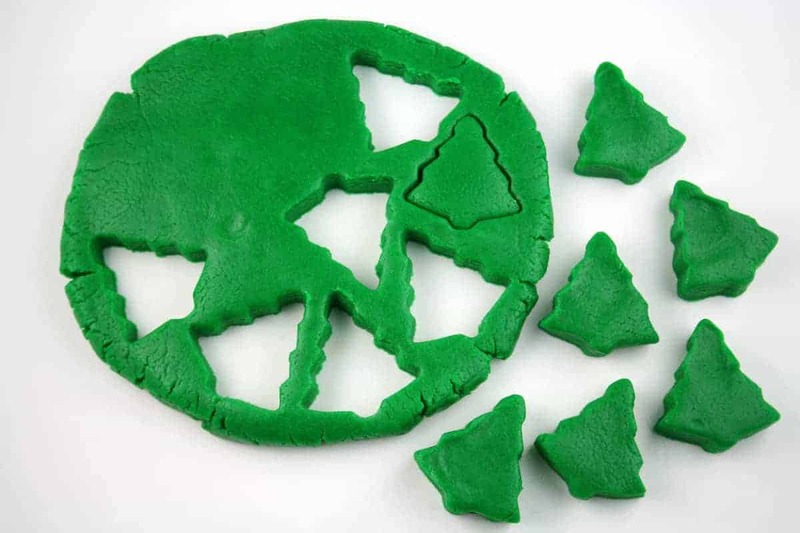 Using a 1-inch tree cookie cutter, cut as many trees as you can. Combine the scraps and roll again. Cut more trees. Repeat. Stack the trees together in 3 rows. Take the remaining plain dough and divide into thirds. Divide each third into smaller pieces that you roll out into narrow ropes of dough. Place the ropes around the trees. You will end up with 3 logs of dough. 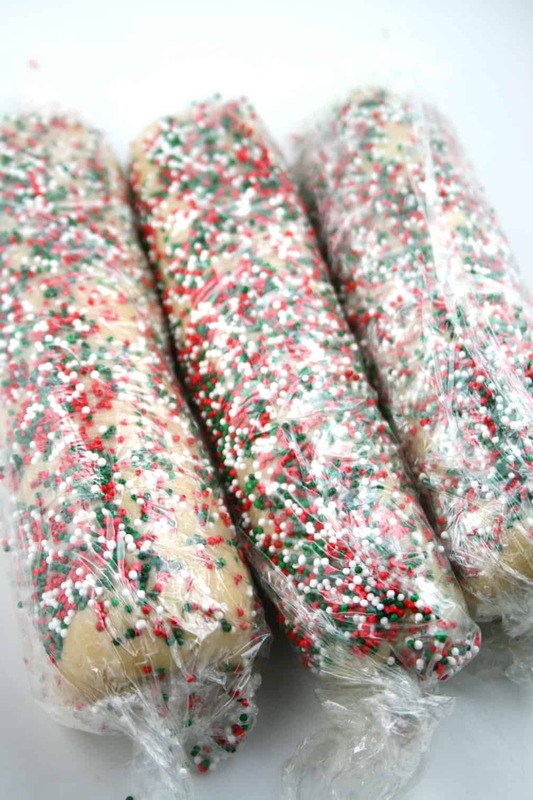 Roll each log in sprinkles, wrap in plastic and refrigerate for two hours or overnight. 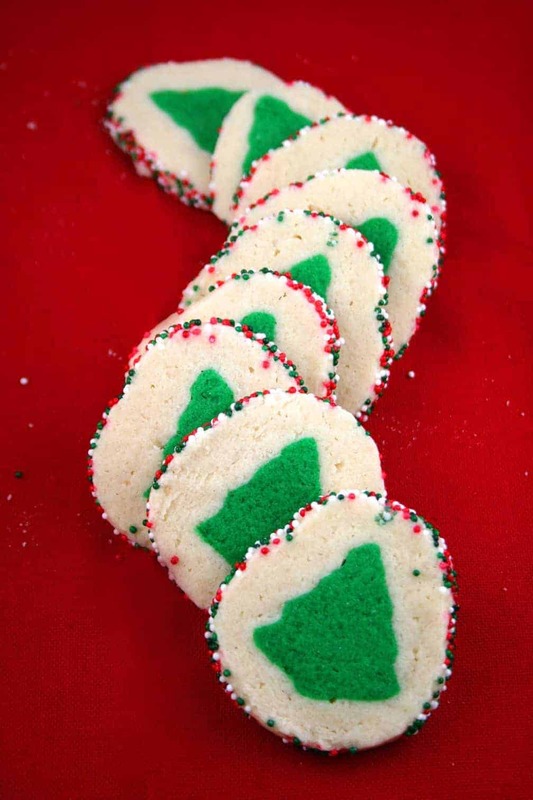 Once chilled, slice 1/4-inch thick cookies and place on ungreased cookie sheets. Bake at 350°F. for 8-10 minutes. Do not overbake. Let cool. Serve immediately or store covered for up to 1 week. They will also freeze well for longer life. Loved this – shame Christmas is over but have pinned for next year. Might try it with some other design in the middle a flower, star etc. Where can I buy an inch cookie cutter. I used Wilton brand and ordered them online through Amazon.com. You also might be able to find them at your local craft store. Could the almond extract be left out or substituted with something else? I’ve got a child with a nut allergy. Of course, you could use vanilla extract instead. 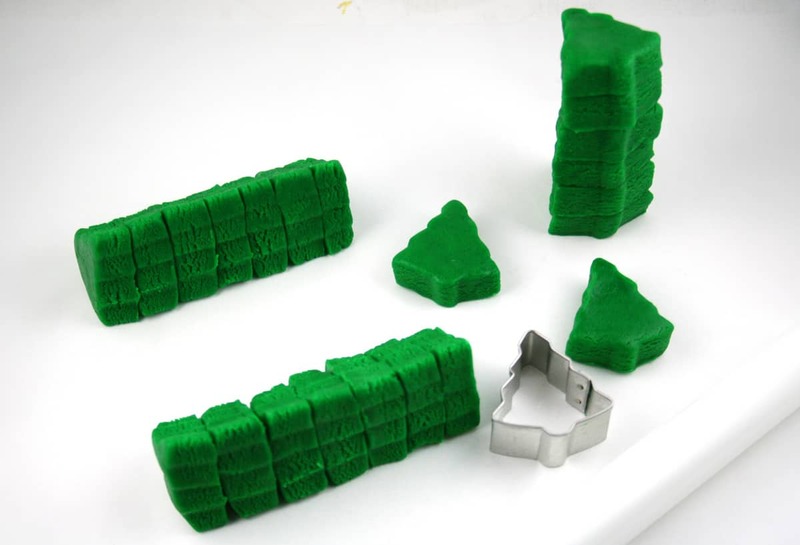 For those curious about the small cookie cutter, I found a set of small Christmas cutters at Michaels. Perfect size for when I try these cookies! So cute! Do we need a pinch of salt? They are baking right now and can’t wait to try them!! Christmas tree shapes didn’t hold up well but they look good and were easy to make! Thank you!